Senior Lee Van Lew II and freshman Aaron Brown sharing a moment during the road contest at Oak Ridge Christian in Morgantown, KY. Van Lew and Brown earned all-tournament honors at the Rosedale Invitational over the weekend. IRWIN, OH — Galilean traveled to Irwin, Ohio to compete in the Rosedale Invitational over the weekend. 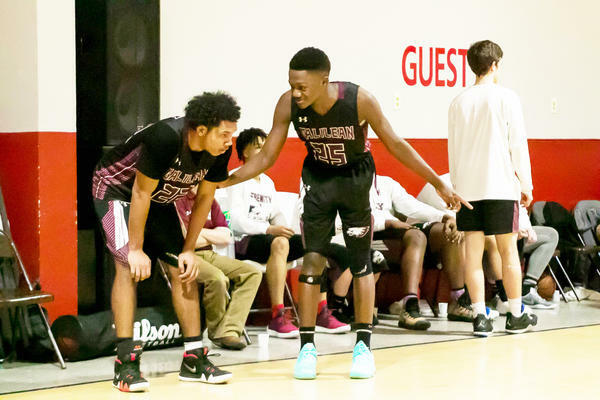 The Eagles made the trek north touting a four-game win streak after a KCAA win on the road over Oak Ridge Christian 69-53 (Jan. 28). GCA had three in double figures including Aaron Brown. The freshman scored 24 to go with a game-high 17 rebounds. Senior Lee Van Lew II bounced back from a string of tough games with 22 points, seven boards, and three steals. Junior Caleb Lewis put in 14 in the win while senior Caleb Lewis dished out a game-high eight assists. Following the 16-point road win, Galilean made their way to Rosedale College for the three-day event in Ohio Thursday morning. The Eagles played a talented, well-coached Arhur-Okaw Christian (IL) on Thursday eventing. It was a second-straight 20-point game from Van Lew that helped lead the way in the opening game of the event as the senior scored 23 points to go with nine rebounds while shooting 71% from the floor. Brown earned another double double scoring 18 and grabbing 13 boards. Galilean outlasted Arthur 81-75 to move to 19-5 on the season. If the first game at Rosedale was the right step, the second game was a two steps back. GCA took on Shekinah Christian at their gym on Friday afternoon. The host team shot the lights out knocking down 10 threes and six of them in the third quarter. The Eagles finally found a way to play their game with about four minutes left, down 15 points. Two threes a piece by Burrows and Lewis in the fourth quarter along with intense defense brought the visitors all the way back to tie the contest at 58 with about a minute to play. Shekinah found a way to get the lead back and led 64-61 with nine seconds to play.